In the human male, testosterone is the major circulating androgen. More than 95% is secreted by the testis, which produces approximately 6-7 mg per day (Coffey 1988). The metabolic steps required for the conversion of cholesterol into androgens take place in approximately 500 million Leydig cells that constitute only a few percent of the total testicular volume. Although Leydig cells are of major importance for the generation of circulating androgenic hormones, the adrenal cortex also contributes to this production. The production of steroids is not limited to endocrine glands but very small amounts, mainly pregnane derivatives, can also be produced in brain cells (Baulieu 1997). Although the contribution of cells in the nervous system to circulating hormones is very small, local production of steroids can be physiologically very important (King etal. 2002) especially when transport and clearance are low. Since Leydig cells are most important for the production of androgens, the steroidogenic pathways in these cells will be described in some detail. The enzymes and intermediates involved in this reaction cascade are depicted in Figure 1.1. 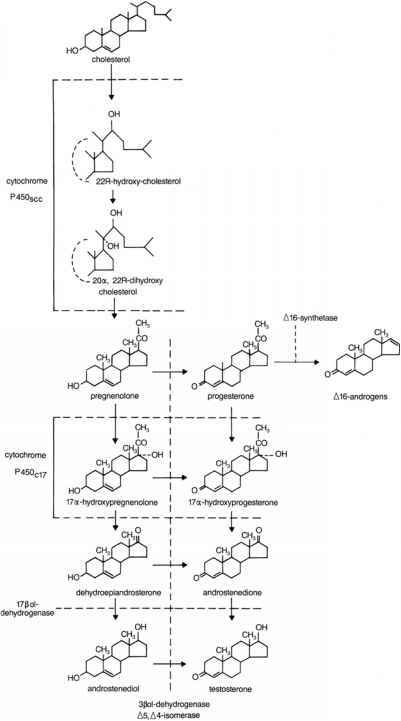 The pathways for biosynthesis of androgens and the regulation thereof have been reviewed extensively and the reader is referred to these reviews for detailed information (Rommerts and Brinkmann 1981; Ewing and Zirkin 1983; Rommerts and Cooke 1988; Hall 1988; Rommerts and van derMolen 1989; Saez 1989; 1994; Stocco and Clark 1996; Payne and O'Shaughnessy 1996). Fig. 1.1 Steroidogenic pathways in the human testis. stores of cholesterol. The relative contribution of synthesis and cholesterol supply from lipoproteins or lipid droplets depends on the species and the extent of stimulation of steroid production. For high steroidogenic activity an ample supply of cholesterol is essential and sufficient hormone-sensitive lipase and enzyme activity for uptake of cholesterol (esters) must be present (Rao etal. 2003). For Leydig cells it appears that the cholesterol in the plasma membranes acts as the main and most readily available pool of cholesterol. A vesicle-mediated transport system involving an endosomal/lysosomal network seems to act as the conveyer belt for intracellular cholesterol transport to the mitochondria. The supply of cholesterol to the outer membrane of the mitochondria also requires transfer proteins and for this process sterol carrier protein2 (SCP2) could play an important role (vanNoort etal. 1988). This protein could facilitate cholesterol trafficking inside the cell in conjunction with the cytoskeleton and the vesicular system, but although many suggestions have been made in this direction, there is still insufficient proof for this model. An important question in this respect is whether changes in intracellular cholesterol trafficking under the influence of LH are a consequence of utilization of cholesterol at the mitochondrial level followed by a re-equilibration process or whether LH actively directs cholesterol movement to the mitochondria. Whatever mechanisms operate, the ultimate result of the coupled intracellular transport mechanisms is regulation ofthe availability of cholesterol at the level of the mitochondria for production of pregnenolone (C2i) from cholesterol (C27). Cleavage of the side chain of cholesterol and the formation of pregnenolone inside the mitochondria is the start of the steroidogenic cascade. Subsequently, pregnenolone is converted to a variety of C19-steroids by enzymes in the endoplasmic reticulum. The biosynthesis of the biologically active androgens is thus the result of a step-wise degradation of biologically inactive pregnenolone. This process is catalyzed by oxidative enzymes, many of which are members of a group ofheme-containing proteins called cytochromes P450. As can be seen in Figure 1.1, the specific steroido-genic P450 enzymes can catalyse different although related reactions. The precise pathways which are utilized for the formation of testosterone most probably depend on the properties and amounts of the various enzymes as well as on the composition of the membrane into which these steroid-converting enzymes are integrated. Under normal conditions the total capacity ofthe pregnenolone-converting enzyme system in humans is insufficient to convert all available pregnenolone into testosterone. As a result many intermediates in the form of progesterone derivatives leak out of the Leydig cells. This illustrates that the rate-limiting step for the production of testosterone is localized at the level of the endoplasmic reticulum, whereas the rate-determining step for steroidogenesis (short term regulated by LH) is at the level of the cholesterol side chain cleavage activity in the mitochondria (van Haren etal. 1989).